If you have dreamy ideas of having a custom patio design tailored to fit your outdoor lifestyle and home, you are at the right place. At Schneider's, our attention is on you, our customer! 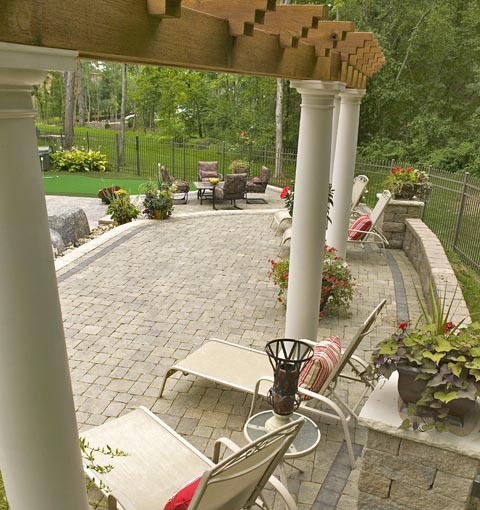 We want to hear your ideas of how you will and want to use your paver patio. Patio ideas you have, such as, patio shape, patterns, grill stations, fireplaces, etc. We'll ask questions like, do you like to grill? do you entertain? do you like to be outside? what is your budget? We ask questions like this so there are no surprises. We ask them so we can custom design a paver patio that will deliver the results that we are always after, one that will be affordable and exceed your expectations. A custom patio design by Schneider's will be beautiful, functional and blend your outdoor lifestyle with elements of your home. All of our custom patio designs are drawn in 3D giving you the assurance that you will know exactly what we are installing and what you can expect your paver patio to look like. So once you've dazzled your guests, you can begin to enjoy the functional qualities that a custom design from Schneider's will bring.